The seminar is based on Ken’s book A Manual of Style for Contract Drafting, which is currently in its third edition. I’ve read the book cover-to-cover several times and have followed Ken’s blog and recommendations for years, so I was familiar with the content before attending the seminar. 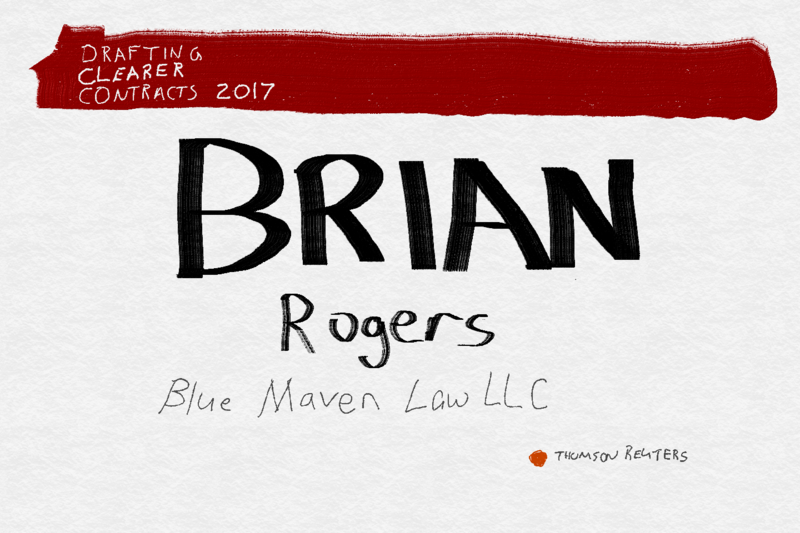 For my thoughts on the value of MSCD, see my review, A Manual of Style for Contract Drafting Should be Required Reading. Although the content of the seminar wasn’t new to me, I’m glad I attended. There’s something about having the teacher in the room that’s much more valuable than reading a book or a blog or viewing an on-line presentation. I gained perspective and clarity about what Ken’s about. Plus, he answered the myriad of questions coming from some self-styled contracts guy sitting in the back of the room! Ken mentioned “fog” more than once during the presentation. Often, drafters have a foggy notion of what exactly we’re trying to say. We’ll start with a precedent, drop in deal-specific terms, and make some conforming changes. But we don’t really think about what each clause means and whether our intended meaning is clearly stated. Clarity is at the core of Ken’s approach. Ken took us through exercises where we analyzed chunks of contract text and improved the language. Over and over, he started with the question of which category of contract language we should use. MSCD contains a fairly lengthy chapter devoted to categories of contract language. In Ken’s approach, every clause can be categorized as language of performance, obligation, discretion, prohibition, policy, declaration, intention, and recommendation. In addition, conditions can be expressed using conditional clauses or language of policy or obligation. When you think through which category is most appropriate, you gain clarity about what exactly you are trying to say. Each category of contract language has its own distinctive language characteristics, so once you’ve identified the appropriate category, you can easily express your thought clearly. For example, language of prohibition is characterized by “shall not” or “must not,” so once you’ve determined that a clause calls for language of prohibition, you can express the thought clearly using that verb structure (e.g., “The customer shall not modify the equipment without Acme’s prior written consent”). If you become attuned to possible areas of confusion, you can improve your drafting by clarifying confusing clauses. Although you might not be able to rid your contracts of every possible bit of uncertainty–because doing so would seriously bloat your contracts–it’s valuable to be aware of the issues so you can clarify the text where it’s appropriate to do so. Throughout the seminar, I had the sensation that we were engaged in a process of continuous improvement. For starters, Ken is continuously improving his recommendations. He receives extensive feedback in the form of high-quality commentary on his blog, and he continuously tests his recommendations in what he refers to as the “marketplace of ideas.” Each edition of MSCD covers more ground and is more fully developed than the preceding editions, and the upcoming fourth edition will be no exception. Not only is MSCD evolving, as drafters struggle with contract language and apply the book’s recommendations, we improve our craft. You can see the process first-hand in the comments to this recent post on Ken’s blog where some of the members of his commenting hall of fame discuss the best way to revise some contract language. I found myself consulting various sections of MSCD as I read through the discussion and considered the commenters’ analysis. I’m afraid I’ll never reach their level of expertise, but as I apply Ken’s recommendations to my own contracts, I improve little by little. My little firm’s internal motto is “always be improving.” Attending yesterday’s seminar was a solid step toward improving my contract drafting. It was a pleasure to meet Ken in person, see him in action, and laugh at his contract jokes. I left the venue impressed with Ken as a person as well as with his life’s work, and I felt inspired to redouble my efforts to improve my contract drafting skills. If you ever have a chance to attend one of his seminars, I’d highly recommend that you do it.